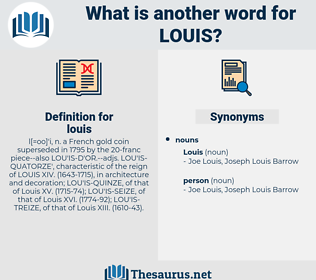 What is another word for louis? l[= oo]' i, n. a French gold coin superseded in 1795 by the 20-franc piece-- also LOU'IS-D'OR.-- adjs. LOU'IS-QUATORZE', characteristic of the reign of LOUIS XIV. ( 1643-1715), in architecture and decoration; LOU'IS-QUINZE, of that of Louis XV. 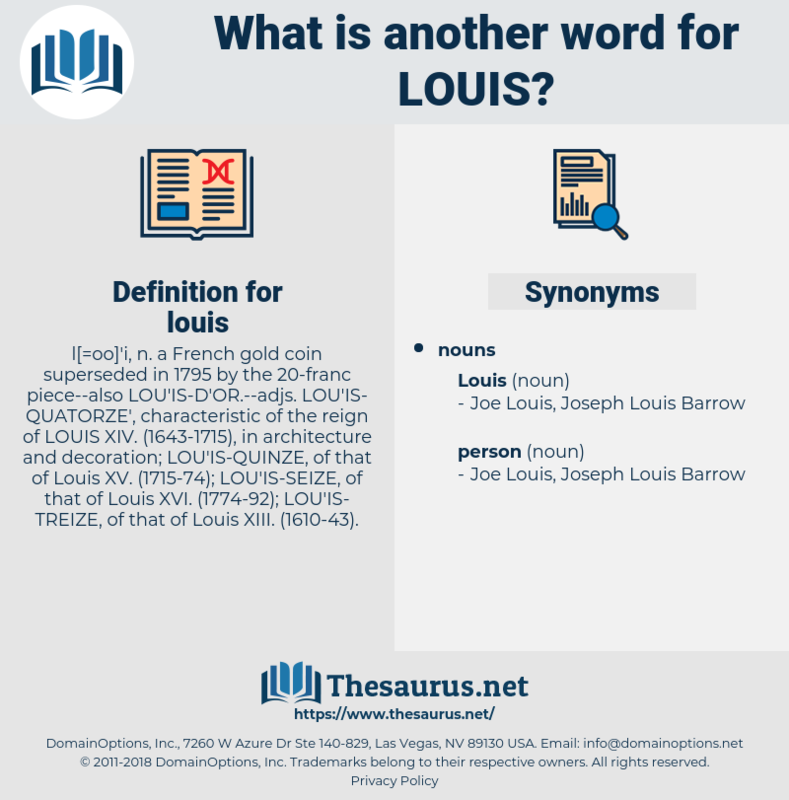 ( 1715-74); LOU'IS-SEIZE, of that of Louis XVI. ( 1774-92); LOU'IS-TREIZE, of that of Louis XIII. ( 1610-43).
" And I have a little money," Annette continued, -" at least, not much money, only a few louis, - but I have these." I love you, Louis, she whispered. lawless, low-key, Lusaka, lax, lollygag, lek, lachaise, lilac, lakh, lack, lallygag, lxii, laic, leggy, Louis Xii, lewisia, leakey, loasaceae, leek, loligo, leak, lhasa, lasix, loge, lilylike, laws, lygus, loach, lichi, lagos, lxxiii, lag, lock away, lycee, lass, loess, liaise, lush, log, lxxi, louche, logic, lascaux, lousy, lewy, lassa, lose, Lego, laicize, lease, lasso, Lake Cayuga, lock, lxx, lie awake, Louis I, locus, lazio, lazy, lewis, lackey, lucas, lucy, lewis', Louis Iii, look away, loch, Lugh, lick, leakage, lucky, Liliaceae, Louis Ix, loloish, loco, logos, liza, lox, legacy, leo ix, lochia, lac wax, luscious, leuciscus, lachesis, losses, lxxxii, lugosi, lac, laugh away, logy, lxxxiii, lassie, lxiii, laos, luggage, Lech, lash, lxxii, liege, logo, laugh, leechee, leaky, laicise, leo xiii, Leo Esaki, locke, lycia, lichee, Louis Ii, legs, llullaillaco, lessee, lao-zi, luke, lxxxi, lough, like, log z's, lysis, lechwe, luge, less, Louis Xiii, lossy, Louis X, leech, loquacious, look, leach, leg, lisu, loggia, leacock, luxe, Leo X, Louis Agassiz, Lewey, liliales, lychee, lxi, lake keuka, laze, loxia, lux, lexis, likewise, loss, lees, lx, luce, loki, lockjaw, loasa, loose, liliaceous, Louis XI, lace, luik, lyssa, luck, louse, lake, lug, lockage, leash, lacy, lycosa, lxxx, laius, loos, leigh, league.